Stores reference 21B/2119. 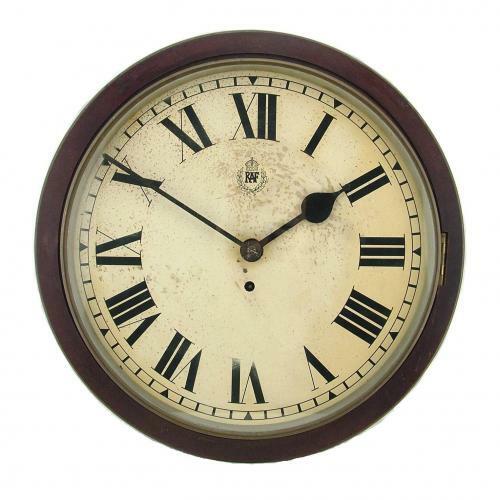 Station wall clock with bakelite surround and wooden backbox. The overall diameter is approximately 42cms. 35.5cm white dial with Roman numerals and King's crown RAF crest. English made self-starting 8-day pendulum driven movement on an open 'A' frame backplate. This is marked to the rear 'Made in England 16'. The case is in good condition and the bakelite surround is undamaged. There is a faint Air Minstry and 1943 date ink stamp to the rear of the backbox and an indistinct handwritten indented mark 'R 1343'. The dial has suffered a little and has staining, minor surface corrosion and paint loss. Retains the original hands and glazed spun brass bezel in good order. With original pendulum and key. The clock is in working condition and keeps good time. A lovely display piece in totally original unrestored condition. The dial could be repainted or improved but we would suggest that a damaged original dial is always preferable to a fully restored example. We would prefer this item to be collected but are willing to post worldwide entirely at the buyer's risk. More photographs available on request. Stock code C21866.